CZ P-09 Czech Republic Handgun 9×19mm Parabellum Replacing the ČZ vz. 82. ČZ vz. 82 Czechoslovakia Handgun 9×18mm Standard service pistol. Heckler & Koch UMP Germany Submachine gun 9×19mm Parabellum Used by the 5th Special Forces Regiment and Military Police. Heckler & Koch MP5 Germany Submachine gun 9×19mm Parabellum Only used by the 5th Special Forces Regiment. Škorpion vz. 61 Czechoslovakia Submachine gun .32 ACP Used to be the standard submachine gun of Czechoslovak forces now in reserve and being retired in favor of German models. Heckler & Koch HK416 Germany Carbine 5.56×45mm NATO Limited use with 5th Special Forces Regiment. Colt M4A1 United States Carbine 5.56x45mm NATO Slovakia announced to purchase via FMS program in 2017.
vz. 58 P Czechoslovakia Assault Rifle 7.62×39mm Standard service assault rifle of Slovak Army. CZ 805 Bren Czech Republic Assault rifle 5.56×45mm NATO Limited use, replacing vz. 58. Heckler & Koch G36 Germany Assault Rifle 5.56×45mm NATO Used only by special forces. FN MINIMI Para Belgium Light Machine Gun 5.56×45mm NATO Used by the 5th Special Forces Regiment. Uk vz. 59 Czechoslovakia General Purpose Machine Gun 7.62×54mmR Standard machine gun of Slovak Army. M2 Browning United States Heavy Machine Gun 12.7×99mm NATO Standard heavy machine gun of Slovak Army. Dragunov sniper rifle Soviet Union Designated marksman rifle 7.62×54mmR Standard designated marksman rifle of the Slovak Army. Heckler & Koch HK417 Germany Designated marksman rifle 7.62×51mm NATO Used only by special forces. SIG Sauer SSG 3000 Switzerland Sniper Rifle 7.62×51mm NATO Used by special forces, but also to become the standard sniper rifle of the Slovak Army. AGS-17 Soviet Union Automatic grenade launcher 30×29mm grenade Standard grenade launcher of the Slovak Army. In the future will be replaced in favor of as yet undetermined NATO standard grenade launcher which uses 40×53mm grenade. MATADOR Israel Anti-tank weapon 90mm Will become the standard AT weapon and replace both the Carl Gustav and RPG-75. 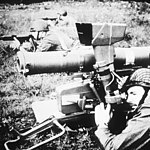 Carl Gustav M4 Sweden Anti-tank weapon 84mm Today used by the 5th Special Forces Regiment. RPG-75 Czechoslovakia Rocket-propelled grenade 68mm Standard anti-tank weapon of the Slovak Army. SA-18 Grouse Russia MANPAD 72mm The only type of manpad active with the Slovak Army. T-72M1 Czechoslovakia 30 Standard main battle tank of the Slovak army. BVP-2 Czechoslovakia IFV 91 Standard IFV of the Slovak army. BVP-1 Czechoslovakia IFV 69 236 in storage. Will be replaced by IFV BOV 8x8 or modernised to BVP-M level. OT-90 Czechoslovakia APC 60 Main armoured personnel carrier of Slovak army. BVP-M Slovakia IFV 17 Slovak modernised BVP-1 by 2018 with remote controlled turret TURRA 30 and new communication systems, more BVP-1 to be upgraded to BVP-M level. BOV 8x8 Finland Slovakia IFV 0 (81 on order) Slovak wheeled IFV based on Patria AMVXP will be delivered between 2018 and 2024. Iveco LMV Italy 10 Used by 5th Special Forces Regiment. International MaxxPro United States ? Provided by USA during deployment to Afghanistan, after the completion of the mission US let the Slovak army keep the vehicles. Currently mostly used by 5th Special Forces Regiment. HMMWV United States ? Purchased from USA during deployment in Afghanistan. Mostly used by 5th Special Forces Regiment. BRDM-2 Soviet Union ? Will be retired from service. RG-32M South Africa 7 Modified version used as part of Slovak army communication system MOKYS. BPsV Czechoslovakia 35 Most in storage. D-30 Soviet Union Howitzer 9 Used only as ceremonial howitzer. More were sold to Afghanistan. VPV Czechoslovakia Armoured recovery vehicle ? VT-72 Czechoslovakia Armoured recovery vehicle ? Czechoslovakia Armoured recovery vehicle ? AV-15 Czechoslovakia Armoured recovery vehicle ? PM-55 Czechoslovakia Armoured vehicle-launched bridge ? AM-50 Czechoslovakia Armoured vehicle-launched bridge ? PMS-815 Czechoslovakia Pontoon Bridger ? PTS-10 Soviet Union Tracked Amphibious Vehicle ? UAZ-469 Soviet Union Utility Vehicle 300 Mostly in storage. Will be replaced by Land Rover Defender 110 SW.
Nissan Navara Japan Utility Vehicle ? Mercedes-Benz G-Class Germany Utility Vehicle ? Volkswagen Transporter (T4) Germany Military Ambulance ? Tatra T-815 Czechoslovakia Utility Truck 800+ 6x6, 8x8, 10x10 versions, platform for fuel tanker, multifit, crane, recovery vehicle, bridge vehicle, etc. ^ "Contracts for April 20, 2017". Archived from the original on 2017-09-18. Retrieved 2017-09-18. ^ "Colt Capitalizes on Foreign Military Sales Program - The Firearm Blog". 27 April 2017. Archived from the original on 2017-06-01. Retrieved 2017-09-18. ^ "Treaty data" (PDF). www.gov.uk. 2017. Archived (PDF) from the original on 2017-03-08. Retrieved 2017-03-08. ^ "Vláda schválila 1,2 miliardy eur na nákup obrnených vozidiel". 17 May 2017. Archived from the original on 2017-05-17. Retrieved 2017-05-17. ^ "Slovenská armáda převzala modernizovaná bojová vozidla pěchoty". Archived from the original on 2018-07-31. Retrieved 2018-07-30. ^ Azet.sk. "Rezort obrany ukázal nové obrnené vozidlo 8x8". Archived from the original on 2017-12-24. Retrieved 2017-12-24. ^ (www.aglo.sk), AGLO solutions. "Nové obrnené vozidlá sú už v rukách žilinských výsadkárov :: Ministerstvo obrany SR". www.mod.gov.sk. Archived from the original on 2018-07-31. Retrieved 2018-07-30. ^ (www.aglo.sk), AGLO solutions. "Vojaci v Iraku dostanú americké Humvee :: Ministerstvo obrany SR". www.mod.gov.sk. Archived from the original on 2018-07-31. Retrieved 2018-07-30. ^ (www.aglo.sk), AGLO solutions. "Spoločnosť BAE Systems dodala armáde prvé prototypy systému MOKYS :: Ministerstvo obrany SR". www.ordinariat.sk. Archived from the original on 2018-07-31. Retrieved 2018-07-30. ^ a b "Slovenské dělostřelectvo získá houfnice Zuzana 2". Archived from the original on 2018-07-30. Retrieved 2018-07-29. ^ a.s., Petit Press. "Obrana nakúpila sanitky bez súťaže". Archived from the original on 2018-07-30. Retrieved 2018-07-29.